Queen Creek Lath & Stucco, Inc.
East Valley Side Job Enterprises, Inc.
Repair needs: Stucco is chipped., Stained or discolored., Stucco is cracked. Comment: Restucco Pool Wall I've got a wall that backs to the pool and needs stucco. The original hope was that we could use stucco over block to create a wall that looked like a solid concrete wall. Unfortunately, the stucco was thin and the underlying block is evident. Stucco Crack Repair I've got several cracks in block/stucco walls in my front yard. Comment: Stucco in atrium over a wood wall to match the opposite stucco wall = goal. Repair needs: Leaking water or moisture, Stucco is chipped., Stained or discolored., Stucco is cracked. 1404 W. San Pedro St.
Scottsdale Siding Contractors are rated 4.68 out of 5 based on 1,009 reviews of 24 pros. 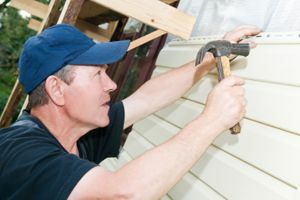 Not Looking for Siding Contractors in Scottsdale, AZ?